Wearing a friendly smile on his face, Harry Hopper is a different kind of grasshopper – one built specifically with old-fashioned fun in mind! The Harry Hopper spring ride comes exactly as pictured; Harry is green and is supported via a red spring. 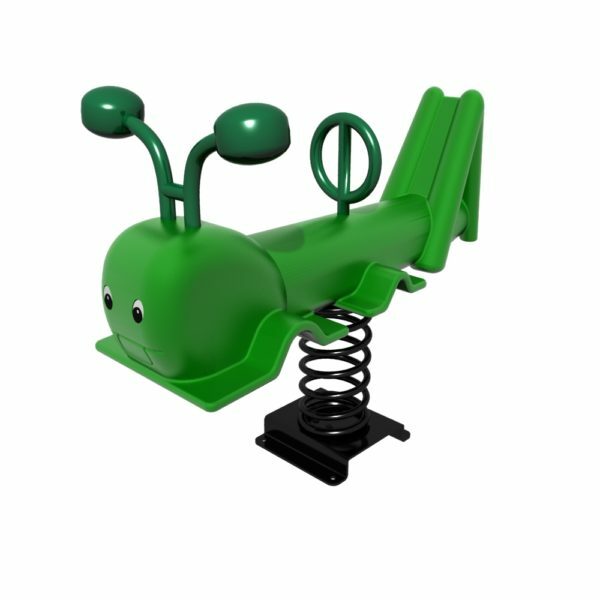 This engaging playground ride has room for two small children to rid comfortably, plus it is equipped with dual hand holds – Harry Hopper’s antennae serve as one set of handles, and an integrated handle and back support behind the front seat allows the child riding on the rear of the spring ride to maintain a firm grip. Harry’s front two pairs of legs serve as secure platforms that make climbing on board for a ride simple, and which prevent slipping while riding. A fun modern take on a playground classic beloved for decades, Harry Hopper can be easily mounted to nearly any surface with basic hardware. These Harry Hopper spring rides are great on their own, and lend themselves perfectly to use in configurations with other spring rides from Qitele and other top manufacturers. Built from smooth and durable materials and designed to last, Harry Hopper is guaranteed to be a popular playground favorite from one year to the next. Safety Zone – 13' 4” x 14' 7"
Critical Fall Height – 2' 2"